A recent article co-authored by NIOM scientist Jan Tore Samuelsen in “Tandlægebladet” breaks down the risks dental personnel face during their working day in terms of exposure to a variety of chemicals. Dental personnel have the potential of being exposed to a variety of chemicals during the working day, many of which may cause temporary or permanent injury. Dentists and dental assistants belong to professional groups most frequently experiencing work-related eczema caused by chemicals giving local irritation or allergic reactions. Chemical exposure may originate from dental materials, where reactive chemicals are released during preparation, polishing and removal of restorations. Other sources of exposure are medical gloves containing allergenic latex protein and rubber chemicals as well as different biocides/chemical disinfenctants for infection control purposes. The article focuses on a number of occupational risk factors in the dental clinic and the limitation of exposure as a major strategy to reduce health risk. Ideally, damages can be prevented by substitution of hazardous substances; a measure that can be difficult to achieve in the dental clinic. The effectiveness of e.g. polymer-based materials and disinfectants is based on properties that also may be the origin of toxic responses. 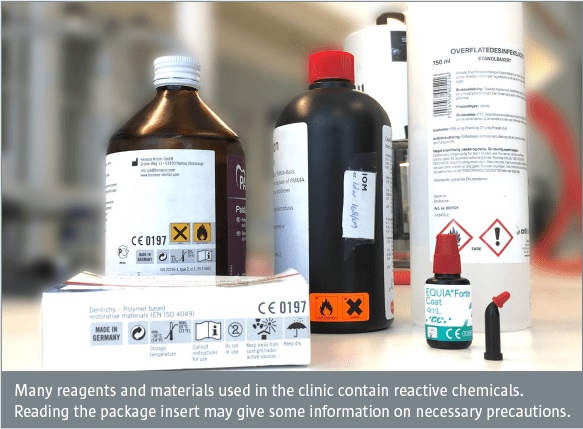 As development of injury basically follows direct contact or inhalation of chemical substances, the damage can be prevented by measures taking these exposure routes into consideration. Attention is drawn to the use of “no touch technique”, high-volume evacuation reducing spatter and aerosol formation and proper use of personal protective equipment in the form of protective gloves, eyewear and surgical masks. Larsen T, Samuelsen JT, Johansen JD. Kemiske stoffers skadevirkning på tandklinikker. Tandlægebladet 2017;121(3):22-27.